A Powerful, Portable Industrial Air Purifier with 30 lb Industrial-Strength Odor & Chemical Removing Carbon, 0.1 Micron Super-HEPA and 400 CFM for Capturing Fumes, Dust & Particles Produced in Hair, Nail, & Beauty Salons, As Well as Art Studios & Hobby Shops & More, All at a Discount Price with Free Shipping! The AirMedic Pro 5 Ultra Salon unit is designed to treat very heavy concentrations of chemicals and odors in a confined space, such as a nalil salon, hair salon, labs or workshops where fumes and dust are an issue. The "Ultra" option offers an extra-large, extra deep-bed 5" thick carbon filter for maximum adsorption of airborne toxins, a 0.1 micron Super HEPA filter for 99.99% removal of particles and an easy-clean pre-filter. 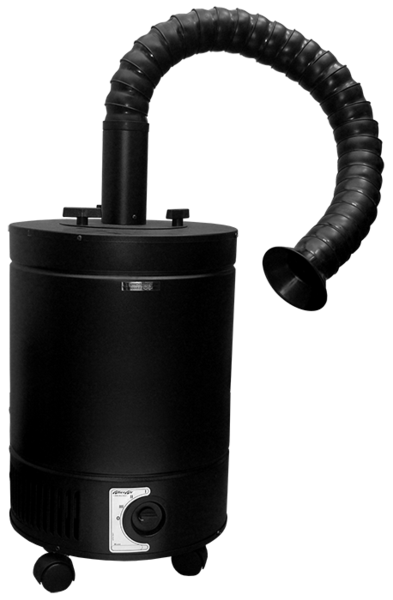 The standard unit comes with 30 lb of quality VOCARB industrial carbon that adsorbs more than 150 chemical fumes, including formaldehyde, benzene, and many more. The unit can also serve as a room air purifier by simply removing the arm and allowing the unit to run continuously in the space. This unit is an excellent choice for salons, offices, workshops, laboratories & medical applications and more where heavy chemical odors, solvent fumes, paint or glue fumes, or fine particles are present. With solid steel construction, long-lasting heavy duty filters and a full 10 year warranty, the Pro 5 Ultra Salon air cleaner is a winner. 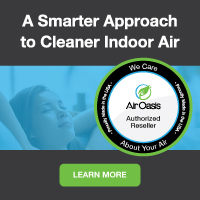 Order your AllerAir AirMedic Pro 5 Ultra Salon & Shop Air Purifier here at a discount online sales price and feel the difference a real air cleaner can make.